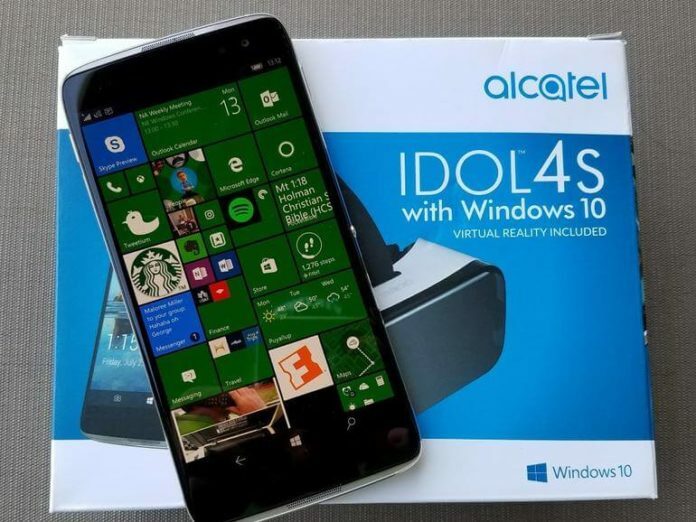 Launched last year, the Alcatel Idol 4 Pro (Alcatel Idol 4s with Windows 10) is a flagship-grade phone running Windows 10 Mobile. It has a 5.5-inch Full HD display with VR capabilities. A VR headset is also included in the retail box. It is powerful than the Lumia 950 & 950 XL and is powered by Qualcomm Snapdragon 820 processor. Cyberport currently has a sale in which you can grab the phone for just €349 ($412). Original listed price on Cyberport was €599 (approx. $705). It has a 5.5 inch AMOLED display with Full HD resolution (401 ppi) protected with a Dragontrail Glass. It is powered by the Qualcomm Snapdragon 820 processor with 4 GB RAM along with Adreno 530 GPU. The phone runs Windows 10 Mobile out of the box. It has 64GB internal storage which is expandable with a dedicated slot for Micro-SD card up to 128 GB. Talking about cameras, the rear camera is a 21 MP shooter with PDAF dual-tone LED flash and the front camera is an 8 MP shooter with LED flash. It also supports VoLTE, WiFi both 2.4 and 5 GHz bands and comes with Bluetooth 4.1. The battery is a 3000 mAh battery which is non-removable. The device comes with all the necessary sensors including compass and gyroscope. It also comes with Type-C port, Stereo speakers, a fingerprint scanner, Windows Hello and VR. Premium glass build, SD 820, FullHD display. Overall it seems like a good deal at this price. You can grab the deal by clicking on the below link. Buy Alcatel Idol 4 Pro at Cyberport.